Photo by Klaus Wachsmuth I had the great pleasure to do my military service in the Swedish Army Band, that at the time (1992) was made up of conscripts. Not only did I get to wear stuff like the picture to the left and play in an awesomely great band, but also did we travel Europe and played, among other places the Casino in Monaco. It was a awesome year in many regards and I tied friendship-knots with a lot of people that still get to meet today.On our last day in the band there were a lot of tears and saying farewell to friends and officers that had taken care of us. Through all the emotions that day I still remember one thing that an officer said as his part of his farewell speech:Fellas - don't fear mistakes. By all means, fail. But try to steer away from irreversible mistakes. I'll tell you right away that I didn't fully understood that then. And maybe not now either, but let me take you through some thoughts on this that have helped me during the 20+ years since he said that to me. And how I've during the last years have found another, simpler approach. I had the great pleasure to do my military service in the Swedish Army Band, that at the time (1992) was made up of conscripts. Not only did I get to wear stuff like the picture to the left and play in an awesomely great band, but also did we travel Europe and played, among other places the Casino in Monaco. It was a awesome year in many regards and I tied friendship-knots with a lot of people that still get to meet today. Fellas - don't fear mistakes. By all means, fail. But try to steer away from irreversible mistakes. I'll tell you right away that I didn't fully understood that then. And maybe not now either, but let me take you through some thoughts on this that have helped me during the 20+ years since he said that to me. And how I've during the last years have found another, simpler approach. What I think that our captain tried to tell us was something about risk. Things will end up failing. That's not a biggie if that doesn't cost you too much. If you forgot to pick up milk... so what? No milk today and but you can pick up some tomorrow. But if you forget to pick up your kid from football training... there will be some bad consequences (it actually happened to a dad in Sweden a few months back - could have been me). So for important things like that you have to put in some kind of warning system that helps you to remember that. The higher the cost of forgetting the thing the more warning systems and help to remember it we need. This is basic risk management and is brilliantly described by Dan North in this presentation that often refer people to. Dan tells us that risk has two components; cost and likelihood. If something is very costly (to miss for example) and also has a big likelihood to occur, well then you sure want to think about it. Deeply. And long. Before you try to do something about it. 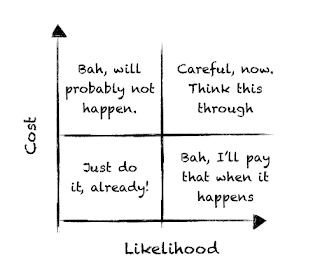 If it's not that costly and not that likely either... well go on... just do it! For another combination you have to make up your own mind. The important thing is that you need to think and make an opinion for yourself. 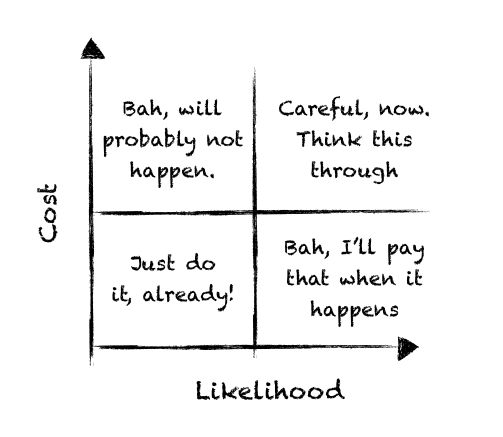 In the diagram to the right you see my very risk friendly decision matrix. Don't use this for all your decisions. However... I'm now an older man with more experience. I'm still not wiser and I definitely don't say that I'm wiser than my captain. He told us to never say that to him, so I better not. But I think differently about matter like these nowadays. I think the real trick lies in failing as fast as possible and make corrections. In fact, I'll go so far as to say that in business the future belongs to the people that can fail and iterate the fastest. It's of course not only me that says that (then I wouldn't believe in it) so please read up on the Lean Startup movement that is swiping the business world, both for startups but also big enterprises. What I mean is that if you can iterate fast the cost of failing goes down. Me driving the wrong way for 10 minutes is not as costly as me driving the wrong way for 10 hours. So I try to check that I'm driving the right way often (if I don't know the way already). You don't need to give me any estimates and plans. I have great fate in you and think that you probably know better than me what is the next great thing to do. Hey - it's even ok that you fail and end up doing the wrong thing. As long as you fail fast and learn from it. I can cover the cost of you doing the wrong thing for two weeks. It's not ok that you fail for three months and then come back to me and say: it can't be done. Let's fail faster than that. Awesome! I'd love an product owner like that. It also acknowledges the fact that we don't know what the best route to success is, or even what we should build to best serve our customers. To know that we have to try it out in a real-life scenario, with real customers, doing real things. And then iterate new versions to correct our early hypothesis on what we thought would make a big business impact. Now... where have I heard this kind of reasoning before... I'm sure it was done by some clever guys... Ah yes - all scientists all over the world since Aristotle and up to today works this way. It's called the the scientific method and has proven useful to them. It might be to me and you too. I suggest that rather than to try to outsmart, outplan, outthink and handle every possible risk and uncertainty we should instead try to redesign our work so that we fail faster. Yes, you read that correctly, I said change the way we work in order to fail faster. I think the future belongs to the people and companies that can iterate fast. What can I do to iterate faster? To fail faster? How can I faster get to know that I'm going the wrong way? That I'm about to forget to pick up my kid? That my code is not only used but also making an business impact? What are the smallest steps I can take to learn more? Most likely I haven't told you anything that you couldn't have read somewhere else. And even more likely there's theories, diagrams and formulas that can prove this. But this was more a kinda of "I feel this" post. I long for you to point me to the theories that support this. Or falsifies it. Please tell me fast - I need to fail. Faster.